Solar power in New Zealand is on the rise, but operates in an entirely free market with no form of subsidies or intervention from the New Zealand Government. As of January 2019, New Zealand has 90.1 MW of installed photovoltaic (PV) solar power, of which 19 MW were installed in the preceding 12 months. Although there are no subsidies, the declining costs of photovoltaics has caused a large increase in demand over the last few years. 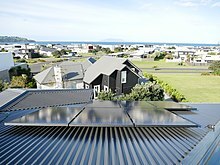 In 2009, the average turnkey price for a standard PV system of three kilowatts (kW) was about NZ$40,000, and has since dropped significantly to NZ$9,000. As of September 2018, 20,712 solar power systems have been installed in New Zealand. The average residential solar power system size is 4.81kW and the average commercial solar power system size is 14.3kW. The largest solar power system on a school in New Zealand was officially opened in a ceremony in February 2019 at Kaitaia College. Hon. Kelvin Davis, unveiled a plaque to acknowledge the installation of the 368 solar panel project which is spread across the rooftop of multiple buildings on the school campus. In January 2014, solar photovoltaic systems have been installed in 50 schools through the Schoolgen program, a program developed by Genesis Energy to educate students about renewable energy, particularly solar energy. Each school has been given a 2 kW capacity PV system, with a total distributed installed capacity of 100 kilowatts-peak (kWp). Since February 2007, a total of 513 megawatt-hours (MWh) of electrical energy have been recorded. As of 2018, New Zealand's largest solar power plant is at Yealands Estate winery in Marlborough, with a total capacity of 412kW. Buy-back rates for solar power exported to the grid range from 7 cents to 12 cents. Cost-effectiveness of a residential solar power occurs when system owners aim to use more of their solar power than what they export, by means of timed appliances, turning on appliances when the sun is out, energy management systems and battery storage. Commercial buildings that use power during the day can get a high return on their investment. A 2015 study found that PV was more economical than grid supply if all the PV electricity was used on site and none was exported to the grid. For residential and commercial installations, improving energy efficiency is a lower cost option than PV. ^ "Installed distributed generation trends". Electricity Authority. ^ "Prices of solar power systems". My Solar Quotes. ^ "New Zealand Solar Power Systems In 2018; Slowly But Surely". My Solar Quotes. ^ "New Zealand's largest solar energy system on a school opens at Kaitaia College". SEANZ. 27 February 2019. ^ "Yealands Wine Group puts in largest solar panel installation in New Zealand". Stuff. ^ "Solar Power Buy-Back Rates NZ". My Solar Quotes. ^ "Solar Power Self-Consumption". My Solar Quotes. ^ Miller, Allan; Hwang, Michael; Lemon, Scott; Read, E.Grant; Wood, Alan (24–26 June 2015). Economics of Photovoltaic Solar Power and Uptake in New Zealand (PDF). EEA Conference & Exhibition. Wellington. Retrieved 22 March 2016. ^ "PV Watts". NREL. Retrieved 26 June 2012. ^ "Installed distributed generation trends". Electricity Authority. Retrieved 7 April 2019.